When the Chrysler 300C was first launched back in 2005, its success proved that there was still a place in the market for a big rear-wheel drive American sedan. A year later, they unveiled the Dodge Charger. 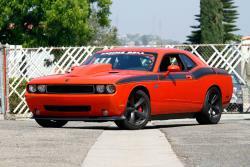 Followed a couple years after that, by the now infamous Dodge Challenger. These big Yank Tanks proved quite popular in America and abroad. So the second generation cars, launched in 2011, featured the latest incarnation of their 3.6L Penastar V6, 5.7L Hemi V8, and 6.4L Hemi V8. A variation of the Chrysler 300, known as the Lancia Thema, was sold to European customers from 2011-2014. And the tire killing SRT trio (Dodge Challenger SRT8, Dodge Charger SRT8, & Chrysler 300C SRT8) got a huge boost in power, thanks to the new 392 Hemi. But if you want to get even more power, while simultaneously protecting your engine, then you need to check out the Spectre HPR11257 OE replacement air filter. Every car has an air filter, and it's designed to remove dust and dirt before it gets sucked into the cylinders, where it can damage the piston rings, valve train, and fuel injectors. Air filters are absolutely necessary, but they can also reduce performance. You see, an OE Dodge air filter or OE Chrysler air filter is made from thick folded paper, and uses what is known as a “surface loading” design. This means that all of the dirt it filters out of the airstream collects on the surface between the folds. As this dirt builds up, less air can reach the motor, which obviously reduces the amount of power it can make. Your Pentastar 3.6L V-6, or Dodge Hemi V8, needs a lot of oxygen to turn fuel into horsepower. And the high-flow Spectre replacement air filter was specifically designed to increase the airflow, while also improving filtration. 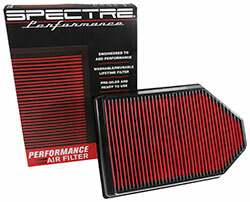 The secret to a Spectre HPR11257 OE replacement air filter, is in its design. Unlike a stock paper air filter, these are made from multiple layers of oil synthetic material, sandwiched between two layers of sturdy wire mesh. This proprietary material allows the airborne contaminants to be stored inside of the material, which is known as “depth loading”. The oil treatment turns the synthetic fibers into a sticky web that’s able to trap much finer dirt particles and lock them in place. The benefit here is, more air can flow through to the motor, more consistently.